Check-in for Air Canada is located in Zone A of Terminal 2 at Heathrow. Typically Economy Class check-in is processed using self-service machines but due to problems with the online check-in service I use the check-in assistance counter. There is a short wait as many of the counters are not operational but once at the desk the process is quick and easy – importantly the staff solve the problem with little fuss. As I was only travelling with hand carry I proceeded straight to security. Boarding is completed in a zonal format and works quite well – customers are organised into their zones in advance of boarding commencing. Once started the processing is efficient but there is some queuing in the airbridge. It is a full flight (95%) and as such there is also some congestion in the aisles. The greeting at the aircraft door is pleasant and there is some presence of staff in the cabin to assist with cabin bags and customers moving seats. This Boeing 787-800 in Economy Class was at almost full capacity with only a few spare seats observed. Air Canada Economy Class passengers are permitted 1 x 23kg checked bag and a 10kg carry-on (23 cm x 35 cm x 55cm). In addition a small personal item such as laptop bag, briefcase or backpack is also allowed with a weight limit if 10kg. The Economy Class cabin is in the higher density (but common) 3x3x3 configuration. The seat has a 31-inch seat pitch and 17-inch width. The legroom is sufficient and the seat width is feels fine. The adjustable headrest adds a degree of additional comfort and there is suitable recline. The PTV screen is clear and there is an USB socket mounted on the console and a 110v socket for larger devices located just below the seat in front – it is a most convenient position. The cabin appears quite clean from an initial visual inspection – however, once seated it is apparent that the PTV screens have not been wiped from the previous flight and many fingerprints are observed. Similarly, once the tray table is unclipped there are marks on the seat in front and the gap between the seats is fairly dirty with a build-up of dust and other debris – it is certainly not the worst standard of aircraft cleanliness I have seen but could be more thorough. The washrooms fixtures and fittings are modern with touch sensitive taps and flush – conditions are okay but staff maintenance is somewhat inconsistent and the floors in particular are quite messy throughout the flight. The flight pushed back more or less on time and after a short taxi from Terminal 2 we were airborne around 20-minutes after the scheduled departure time arriving into Toronto 25-minutes early. There is no pre-lunch beverage service and the first beverage is offered with the meal tray approximately 45-minutes after the seatbelt sign is turned off. The choices today are chicken, mash potato and a tomato sauce or pasta in tomato sauce, with a couscous salad and raisin oat cookie. On the tray is a cold bread roll, butter and a bottle of water. The food is tasty and above average overall – the chicken is tender and the potatoes and tomato sauce are also nice. The couscous has a nice fragrant flavour. The only disappointing element is the bread roll which is served chilled. In terms of beverages, in addition to the bottled water on the tray a bar service is offered with the meal tray which offers a full range of alcohol (including spirits), soft drinks and juices. Tea and coffee is offered once the trays are cleared – whilst the number of beverage services offered is a little limited compared to other carriers, the staff seem more than happy to take requests and the service is completed in an obliging manner. The staff are fairly efficient at offering water throughout the flight and approximately 1h30m prior to arrival a branded (Monty’s) hot sandwich is offered (chicken or vegetarian) and another full bar service. 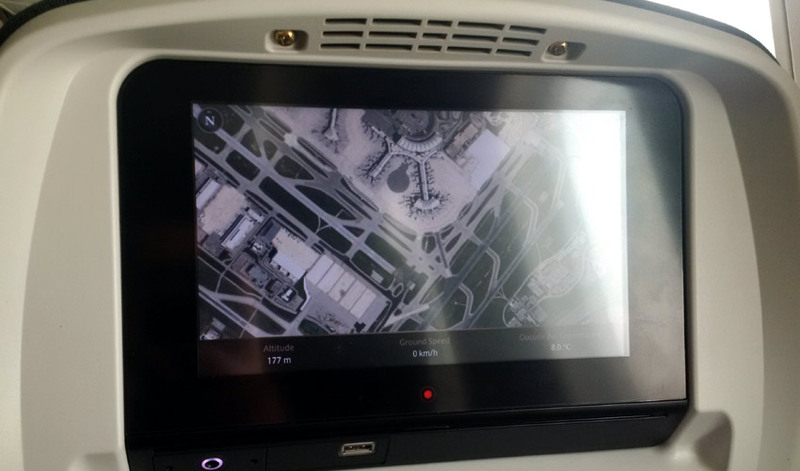 The IFE is Air Canada’s latest product and the touchscreen user-interface works well. There is also a small fixed control on the armrest for the volume / brightness / overhead light etc however, it is quite easy to mistakenly press this with your elbow which can be annoying. The programming choice offers a good range of film options and aside from the usual Hollywood selections the International choice is quite extensive and there is also an extensive range of Canadian options which is an interesting alternative from the norm. TV programming offers a lot of options but many are limited to a just a few episode per season and as such the potential for binge watching is limited. Headsets are given complimentary after take-off and the quality of these is good for this in-ear type. Pillows and blankets are available on each seat and these are standard airline quality. In the washrooms there is only hand soap and no additional moisturiser / hand lotion that a few airlines offer. The staff service overall was pleasant – whilst certainly not as attentive as one might experience from carriers in Asia and the Middle East, the staff are polite and obliging and are fairly present during all periods of the flight. Dialogue during the meal and bar services is a little basic but the general energy is positive and leaves a good impression. Aside from the somewhat inconsistent washroom standards there was little to complain about from a staff service perspective. Upon arrival in Toronto I was transiting to a US connection and used the pre-clearance service. There is no specific Air Canada assistance provided through the arrival process (unless seeking out the transfer desk) but there are plenty of airport staff around to answer queries. The US pre-clearance processing was slow and appeared under staffed considering the number of customers, however, there did appear to be a fast track service available for customers with short connections and this was offered at the discretion of the airport staff. 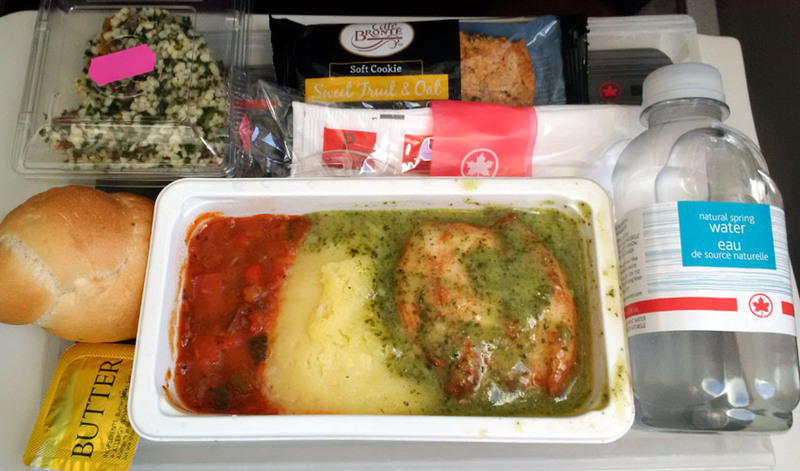 The experience on this occasion was a positive one with Air Canada – the seat comfort was good and most passengers should find something of interest on the IFE system. I found food standards overall to be above average and considering the flight duration the quantity of food was also satisfactory. The staff were pleasant and in comparison to other North American (and many European) airlines I would also judge this to be above average in terms of proactivity and customer service quality. 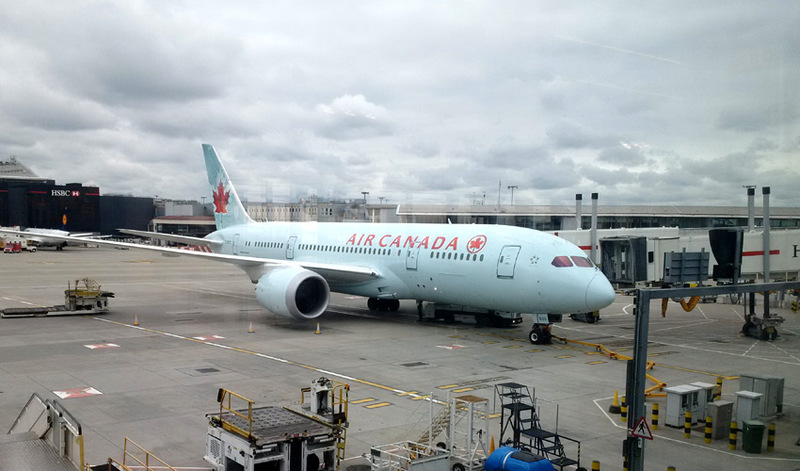 In terms of the total experience (including the airport) I would not hesitate to use Air Canada again for a US connection. Whilst the pre-clearance was slow (of course not the fault of Air Canada) I found the overall transit process here in Toronto better than most major US airports and for US destinations either underserved or without a direct connection to London I would really recommend this as a viable option.